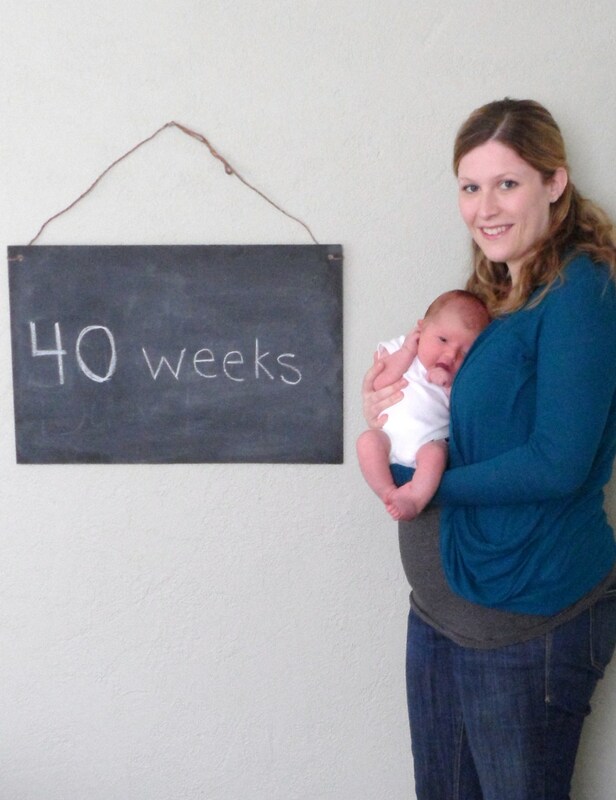 Throughout most of my pregnancy, I thought for sure I’d deliver late and go past 40 weeks, but I was wrong! I’m so glad Liam joined us a little early because now that he’s here I can’t imagine my life without him. I wore jeans for the first time this week, but they’re maternity jeans, which I plan to wear for a while. Clothes are really hard right now, especially due to my c-section incision (birth story to come), so I’ve been living in sweat pants and nursing tanks. I’m also wearing my “push present” which my husband gave me right before we headed to the hospital for induction. It’s this initial necklace from Nordstrom and I love it! 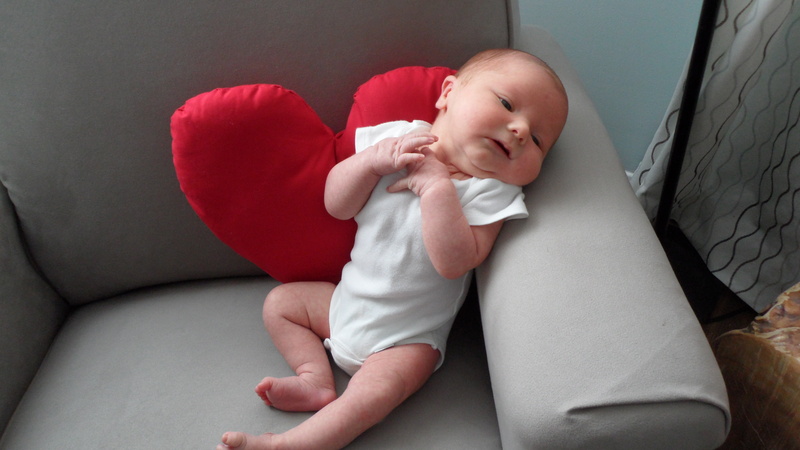 Liam had his first weekly photo shoot today, too! I can’t believe it’s already been a week! The first three days were spent in the hospital, which made our stay there a total of 5 days – a bit much for us all. It was nice to get some extra help with breastfeeding, but we were glad to finally go home on Monday night and give Liam the grand tour! Since then, he’s been on walks with Grammy (my mom) and Tio (my brother), to the pediatrician for a controlled feeding and blood test (poor buddy, but yay for improved bilirubin levels), had visits from honorary Auntie Angie (my BFF), Great Aunt Kerry and her family, and other friends and neighbors, had a sponge bath, and gotten on a bit of a schedule of eating every 2.5 to 3 hours, which is much better than the chaos we started the week with. Breastfeeding is going well, which I am so grateful for. It’s really hard, don’t get me wrong, but we’re both working hard and it gets a little easier each day. Hopefully all of our hard work will pay off with his next weigh-in at the doctor! My husband and I are so in love with this little man. I’m already sad thinking about him growing up because I can’t imagine him getting any more perfect, but I know every stage will be just as amazing as this one is. 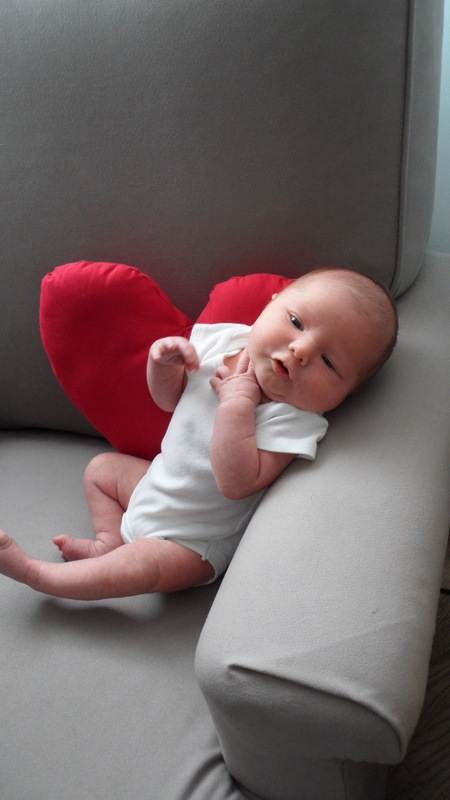 So, now the weekly photos will feature pictures of our growing boy outside the womb! I’ll continue to post them on Fridays, which makes sense because he was born on a Friday. 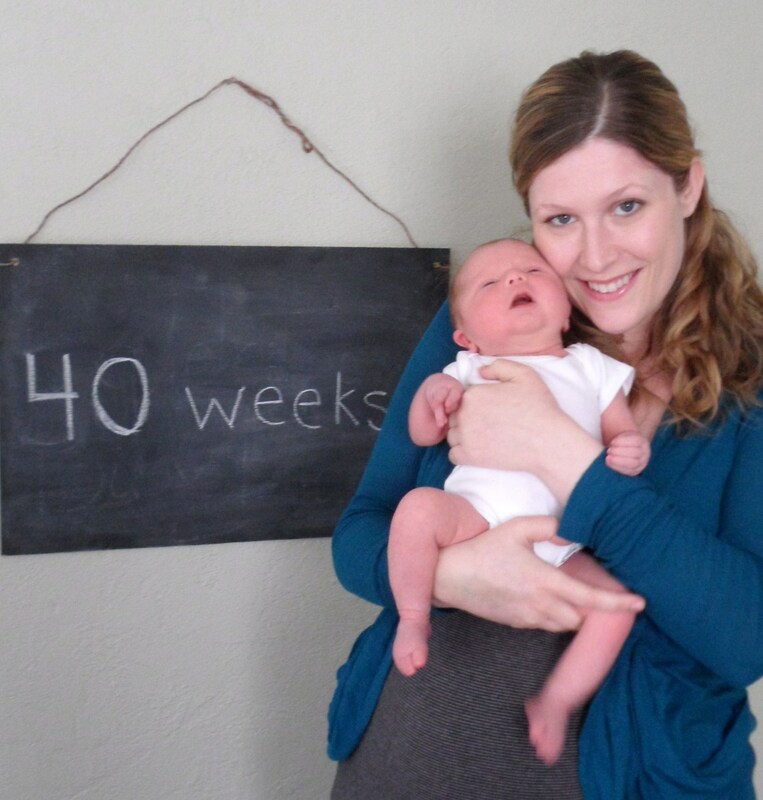 I’m working on writing my birth story, so keep checking my posts over at Hellobee! He is so so precious!!! 🙂 Those cheeks are ADORABLE!!! Congratulations! He is a beautiful baby boy! I feel like I took this journey with you by reading your blog and it’s so wonderful to see a happy ending and new beginning to this story! It makes me look forward to having my own baby one day! Best wishes and so happy for you! I’ve been following quietly for a while, but I want you to know you were made to be a mother. And emotions can be a little troubling right now… Know it ‘s the hormones and lack of sleep. It’s not you. You’re doing a great job. He is so amazing! 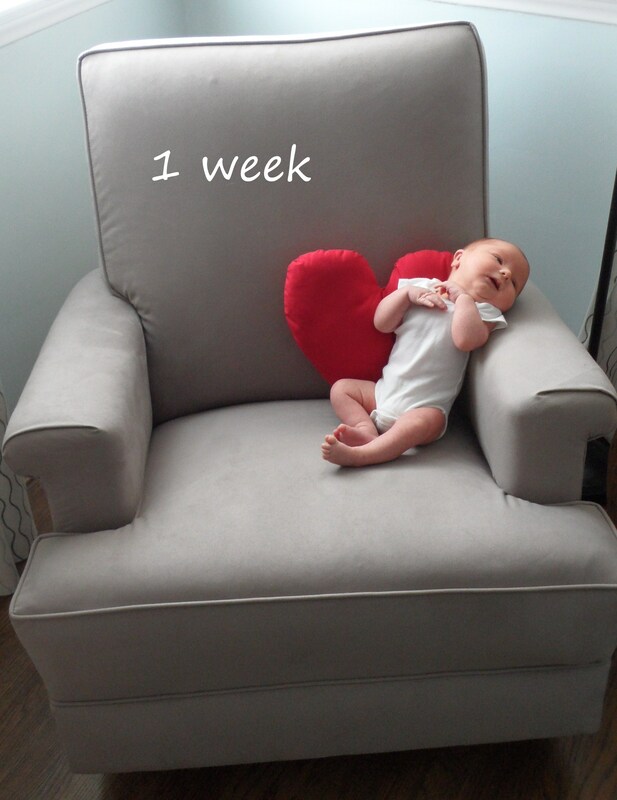 Happy one week Liam! Beautiful Blog! I found you via Hellobee. I’m Mrs. Bicycle! Oh hi there! Thanks for stopping by!